. : Farm Forest Line - Height:. 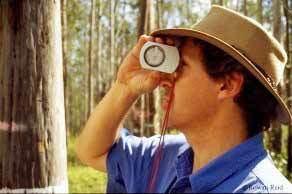 Measuring tree heights using the Master TreeGrower TapeTotal Tree Height (Ht) refers to the vertical height from ground level to the tip of the tree. In many cases the grower may be interested in the height to a particular point, such as the pruned height (PHt) or the height to an obvious defect. In any event, the same measuring techniques can be used. The height of young trees, up to six metres, is easy to measure with a height measuring pole or a simple plastic plumbing pipe marked at 0.1 metre intervals. But, as trees grow, measuring their heights becomes increasingly difficult. Although foresters use a number of expensive optical and laser tools to measure heights, it is possible to use very simple and cheap tools. 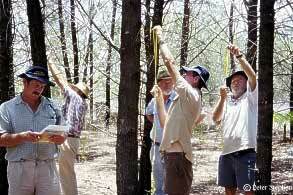 Extra care is required when measuring leaning trees. This technique requires two people. One person with the tape needs to stand well back at a point approximately equal to the height of the tree. The second person needs to stand at the base of the tree. The first person, holding the tape vertically out in front, closes one eye and looks past the tape so that the tree appears next to the rule. It is important to ensure the tape is vertical. For greater accuracy a level and ruler could be used. The tape should be moved so that the "0" point on the rule corresponds to the base of the tree. The apparent height to the top (or any other point) of the tree can then be measured. The person standing beside the tree should move their hand up or down the stem, to the point that corresponds to 10% of the total "apparent" height. Clearly this point on the tree will correspond to 10% of the total tree height. The first person then returns to the tree and measures the height from the base to the second person's mark on the tree. The total tree height is simply this height multiplied by 10. For heights of less than 10 metres, the operator should use a point that is 20% (one 5th of the apparent height) of tree height rather than 10%. For very tall trees, over 25 metres, they might find they need to use 5% (one 20th of total tree height).This technique simply involves the projection of two triangles of proportional dimension as shown in the figure below. There is no need to know how far away the operator is from the tree or to worry about sloping land. Geometrically the technique is accurate. The tape is held vertically at arms length (the tape should be let hang momentarily before being pulled tight and sighting). When sighting it is important for the operator not to move their head. Standing well back from the tree it should be possible to sight the top and bottom of the tree without moving ones head. Careful note should be taken of the bottom of the tree so the vertical measure on the tree is made from the same point. It may be helpful to have the second person mark the base-point with their foot and for the operator to sight their boot. Measuring tree height using a Clinometer. There is a range of expensive tools available to estimate tree height. The most common is the Clinometer which measures angles and allows the operator to determine the height of a tree once the horizontal distance to the base of the tree is known. Laser tools that can accurately determine distance and angle are also becoming more common in forestry. The advantage of these tools is that they reduce the likelihood of operator error and speed up the procedure, but they are expensive.